If you’re tall or short, and/or have an unusually shallow or steep swing, you may want to think about visiting your local club professional who can check whether the lie angle of your irons is appropriate. At the point of impact, if the head of the iron is too flat (i.e. the toe points down) it can drag on the grass, acts for an instant as a pivot, and causes the plane of the face to tile towards the right – which is where the ball will go. If the lie is too upright, the heel of the club will dig in and cause pulled shots to the left. As a rule, shorter golfers will generally benefit from slightly flatter lies; taller golfers may need them tweaked upright a little. Most manufacturers do offer ironsin a variety of different lies – but generally only as a special order. So how do you tell whether the lie is correct on your clubs? The technology for testing this is very simple. Your local pro should be able to help, and what they’ll do is put some masking or impact tape on the sole of the club – and gets you to hit some balls off a lie testing board (essentially a black strip of hard plastic). This leaves a mark or hole in the tape when you hit a ball off it. If everything is hunky dory, the tape will be marked where the centre of the sole is and the clubs are fine. If it’s marking towards the toe, lie angle is too flat, and towards the heel, too upright. 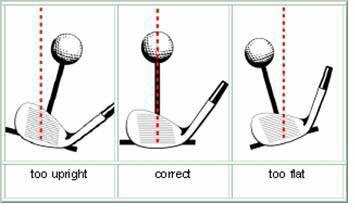 It’s worth noting that because an incorrect lie angle causes the plane (and therefore, loft) of the club to become tilted, getting the lie angle correct is much more important on short ironsthan long irons. Once you’ve established whether or not the lie angles need tweaking, most clubs can be usually altered in a matter of minutes by your local pro for a modest fee, well worth paying. Similarly, it is also worth having the lofts of your clubs checked, say, once a year. If you’re playing a lot of golf with forged clubs – which are made of softer metal – it might even be worth having them checked more regularly. Club heads are just bits of metal – and hitting them regularly on the ground (as you do withevery shot) will over time inevitably bend them out of whack to some extent.Even brand new clubs straight from the factory have a tolerance which might beplus or minus 2 degrees. So why is it important to check them? Club heads are just bits of metal – and hitting them regularly on the ground (as you do with every shot) will over time inevitably bend them out of whack to some extent. Even brand new clubs straight from the factory have a tolerance which might be plus or minus 2 degrees. So why is it important to check them? With thanks to Ping Golf, here is the specification table for their G5 irons. You’ll see that there is 3 to 4 degrees of loft (equating to roughly 10-15 yards distance) between each club. So, the loft on the 3 iron is 21 degrees, and on the 4 iron 24degrees etc. If, for example, on your own set your 7 iron loft was, let’s say, a couple of degrees week (ie more lofted) and your eight iron a couple of degrees strong (ie less lofted) it could mean that both clubs have exactly the same loft – and you could be hitting both clubs the same distance! This scenario is not as unusual as you might think – so, go on, get your lofts and lies checked, give your local club pro some well-deserved business, and do your golf game a favour at the same time. They are here Monday-Friday between 8:30am and 5:30pm to help and offer advice should you require it.